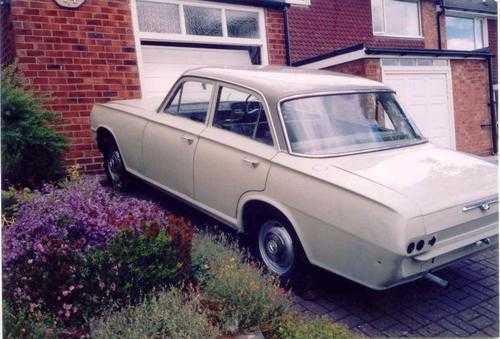 The resurrection of a 1963 Vauxhall PB Cresta. 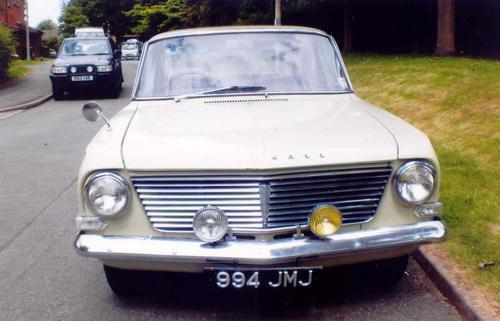 I was looking for a 2.6 PB Cresta, a car with a sound chassis and body. The condition of everything else was less important initially as it could be dealt with in due course. 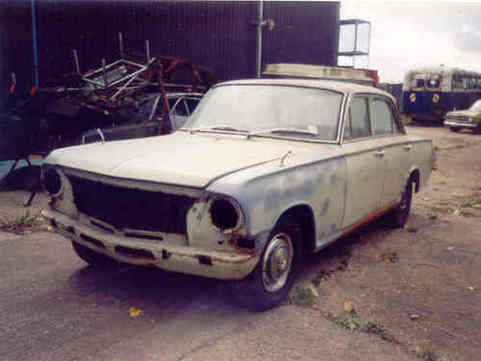 The car selected had been standing partially dismantled for some years and being sound but scruffy, ticked all my boxes. The first owner (?) kept it until 1978 by which time it had covered 52,000 miles, the second owner had raised this to 56,000 by the time I bought the car in 2003. 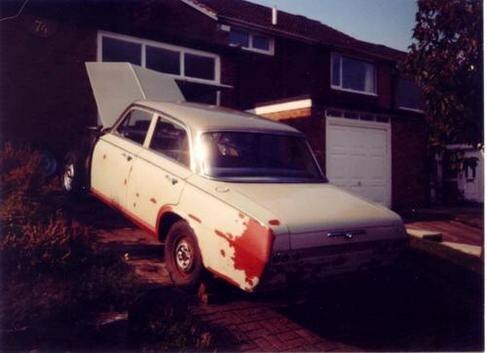 The engine was noisy (piston slap), the brakes seriously sticking (master cylinder) and the electrics unknown so the car was trailered home, where we had to cut the flexible brake pipes to release the disc brakes to unload the car. To return the car in the short term to a condition where it would pass the MoT and be therefore legally mobile under its own power, before embarking on the less urgent items. 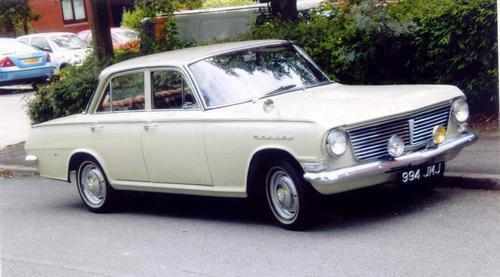 In the long term I wanted a reliable car which I could use as a spare car as necessary and for pleasure. 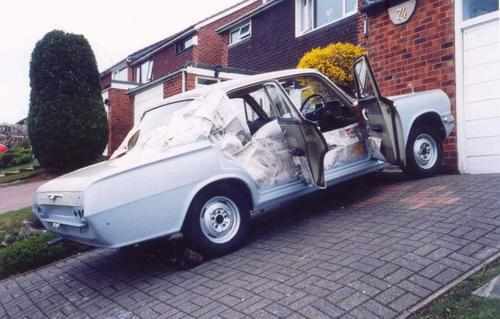 Stage 1: To pass the MoT. Overhauling the brakes had become the most urgent item on the list as we live at the top of a hill, the driveway slopes steeply down to the road and the majority of the work would have to be done on the drive. This involved replacing the servo, the master cylinder, flexible brake hoses, wheel cylinders and of course the fluid. This was largely achieved with the car jacked to a dizzy angle held only with blocks of wood behind the wheels. 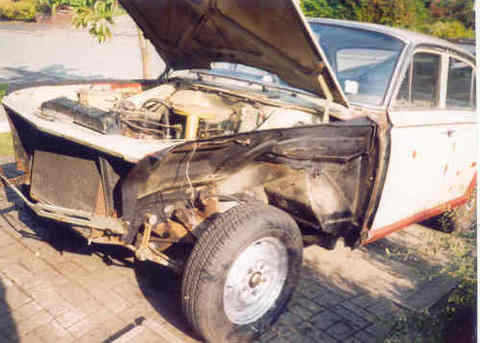 Next it was the turn of the bodywork, and all the bolted panels were removed and then dealt with one at a time. 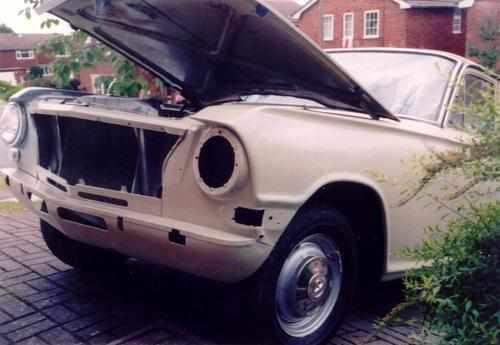 The loose under-seal was removed, the panel primed and new under-seal applied. Box sections and doors were treated with copious quantities of Waxoyl. 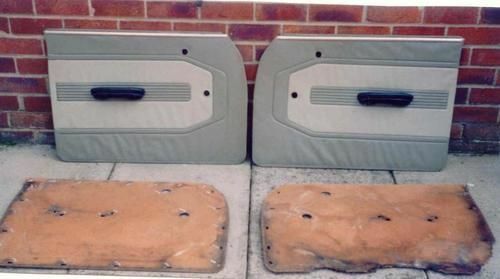 Externally the panels needed TLC and were primed, filled and flatted until an acceptable surface was achieved. The roof was a special case, having been subjected in the long term to bird droppings which had destroyed the paint through to the metal in several places. Gradually the panels came up to an acceptable standard and the first layer of top-coat colour was applied. At this stage, the lights and all things electrical were tested and reconnected and a stainless exhaust system fitted. 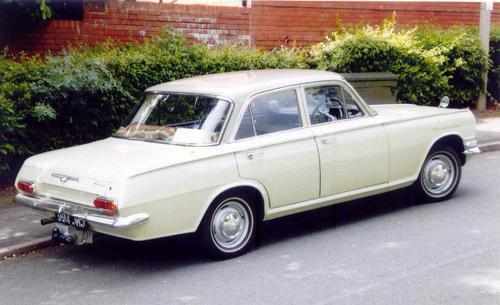 Now we were focusing on the MoT test, the tyres were good, the brakes worked well, steering and suspension had no wear and responded to greasing, in fact most of the expected problems melted away. 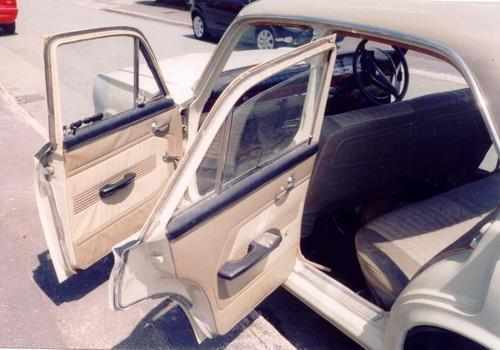 All except that is for the matter of the seat-belts, they were fitted but were dirty, frayed and jammed. At this point the law is kind to cars of a certain age. 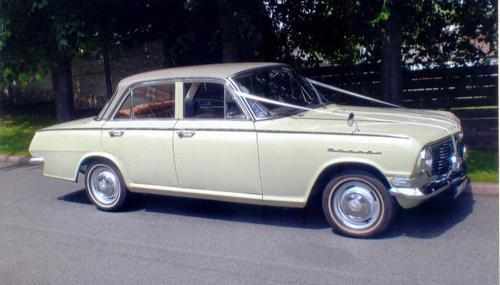 It is necessary for post 1963 and pre-1966 cars to have the anchorage points fitted (but not the belts) and the anchorages must be sound. After 1966 the belts must be fitted to those anchorage points. The solution was to remove the belts from the car and replace them with new belts at an early opportunity, but not necessarily before the MoT. 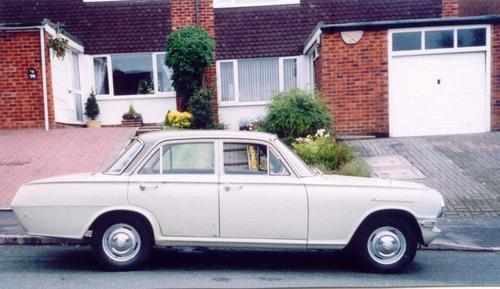 JMJ passed the Mot with flying colours albeit without bumpers (no brackets) no chrome and no seat-belts. Stage 2: Now for the real work. Then the real work began, but the car was mobile and able to drive to appointments under her own power. The engine needed attention and accepting that it needed major surgery, I contacted the previous owner who I knew had fitted piston rings, to find out whether the engine had been re-bored. 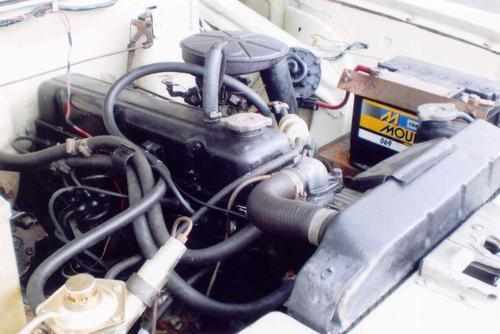 It had not, so a 30 thou re-bore was undertaken to correct the piston slap and while the head was removed, it received hardened valve seats to enable the car to rum on unleaded petrol. The work included regrinding the crank, new pistons, seals and bearings. A new alternator, solenoid, flywheel ring-gear, clutch, timing chain and water pump were fitted at this stage and the starter motor overhauled. To enhance reliability an electric petrol pump and in-line filter were fitted. 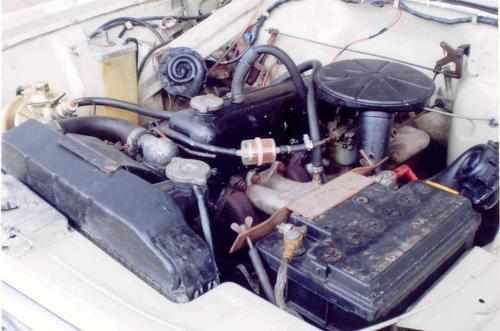 The previous owner had expressed some concern about being unable to restart the car when warm, and a manual choke carburettor was fitted to correct this (successfully). The next stop was the spray shop to complete the re-spray professionally, and the top coats of Silver Sage and Deerskin were applied to the body and roof respectively. 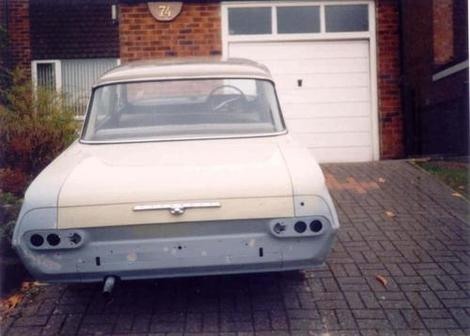 It was then possible to refit the bumpers and all the body chrome which, with the white wall tyres, completed the external work. I also fitted a sturdy tow-bar, to discourage others from amorous parking. The interior had not received any attention to date, and the scant remnants of carpet only served to give a clue as to the colour and quality to be matched. 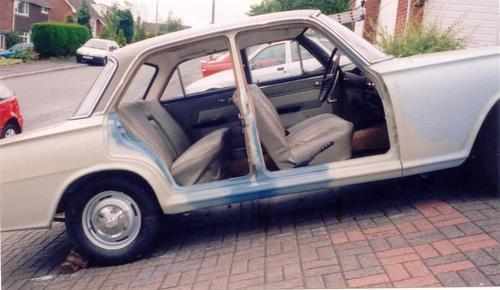 The front door cards needed replacing due to water ingression although the vinyl coverings and arm-rests were re-useable. 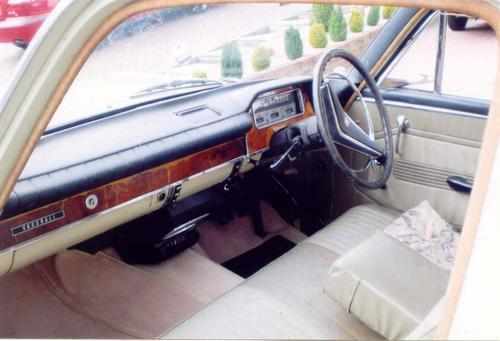 The leather upholstery is serviceable for now, but is likely to be the next cause for major expenditure. The rest of the interior responded to a good scrub and some polish. New carpets were sourced from a firm who has patterns for pre and post war cars, offering a selection of colours and qualities correctly piped at the edges. Replacement seatbelts were sourced from the internet and fitted. 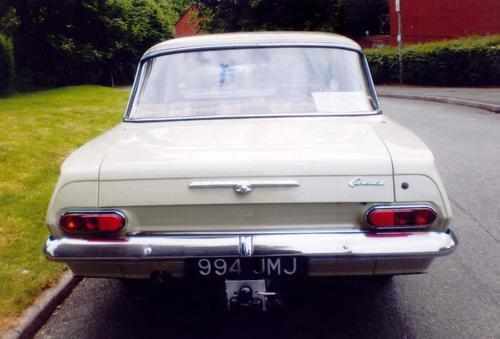 There will always be something needing attention as a car of this age thrives on TLC, but for now she is up and running (rather well) and the “Running In Please Pass” in the rear window is the only clue to amount of effort needed to resurrect a 1963 Vauxhall PB Cresta to run and enjoy for another 50 years.